The stable measures 11.5 inches by 11.5 inches. Joseph measures 5.75 inches tall. This set was crafted in Bethlehem by the Giacaman Family. 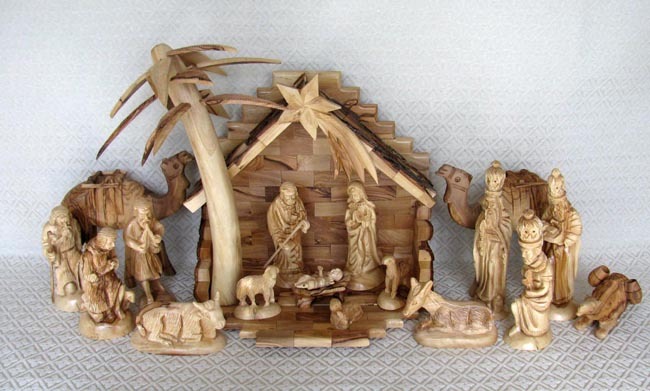 Ibrahim Giacaman is a fourth-generation Christian master woodcarver. Along with his father Salem, Ibrahim runs the largest olive wood factory in Palestine, located on Manger Square in Bethlehem. Ibrahim first learned to carve from his father and grandfather Elias. He studied art and sculpture in Bethlehem and later at the Academy of Fine Art in Florence, Italy. At the family business where his father, three brothers, and two sons also work, Giacaman creates all the designs and personally finishes and polishes each piece. The family uses the olive branches pruned from olive groves for all of their carvings, meaning trees are never cut down for the wood. Every two years olive trees are pruned so they bear fruit. The branches are dried for a year or more before the wood is ready for use. Great care is taken in selecting, drying, and carving to showcase the unique grains of each piece.